An abstract base class for TLS implementations. Definition at line 31 of file tlsbase.h. Definition at line 39 of file tlsbase.h. Definition at line 46 of file tlsbase.h. Implemented in TLSDefault, SChannelBase, OpenSSLBase, GnuTLSBase, GnuTLSClient, GnuTLSClientAnon, GnuTLSServer, and GnuTLSServerAnon. Implemented in TLSDefault, SChannelBase, OpenSSLBase, and GnuTLSBase. Definition at line 128 of file tlsbase.h. 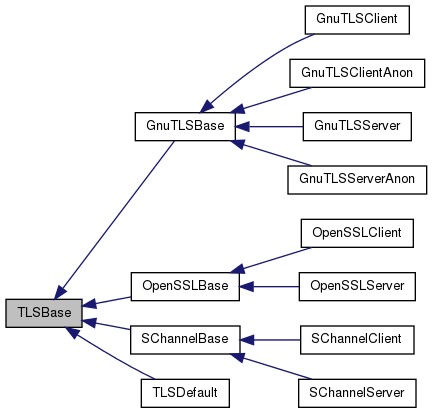 Implemented in TLSDefault, OpenSSLBase, GnuTLSBase, SChannelClient, and SChannelServer. Implemented in TLSDefault, GnuTLSClient, SChannelBase, GnuTLSClientAnon, GnuTLSServer, GnuTLSServerAnon, and OpenSSLBase. Definition at line 122 of file tlsbase.h. Enables/disables initialization of the underlying TLS library. By default, initialization is performed. You may want to switch it off if the TLS library is used elsewhere in your applicationas well and you have no control over the initialization. init Whether or not to intialize the underlying TLS library. Definition at line 71 of file tlsbase.h. Sets the subject/common name to search the system certificate store for. Used only by the SChannel implementation (Windows). Required for SChannel server, optional for SChannel client. The system 'MY' certificate store will be searched for the subject (substring match) for a private key/certificate pair which will be used. On the server-side, initialization will fail if subject is not set or if no associated key/certificate could be found. On the client-side initialization will fail if a subject was set for which no key/certificate pair could be found. Setting no subject on the client-side is fine. setSubject() must be called before init() to be effective. Definition at line 85 of file tlsbase.h.